The participants in the contest applaud the awardees. 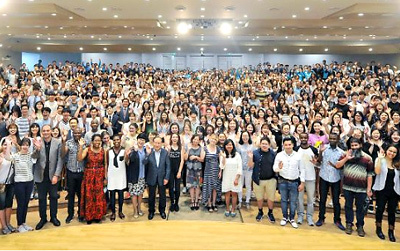 At the 14th Foreign Language Bible Preaching Contest held on May 27, the sound of preach ing in various languages was heard from all over the Okcheon Go&Come Training Institute, where trees and fields became greener. 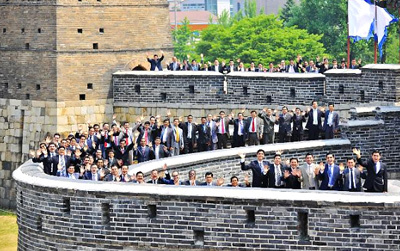 The contest was prepared for the members who planned for an overseas mission during their summer school breaks or vacations, and who had a will to participate in it in the future. 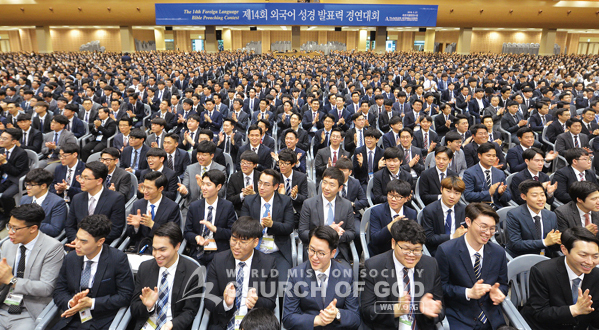 Around 6,500 members checked their ability of preaching in a foreign language, and firmly established their will to complete the mission of preaching to seven billion people. As if it proved their enthusiasm for the mission, which becomes more fervent year by year, the number of participants in the contest increased by more than 1,000, compared with the previous contest. Before the event started, the participants didn’t put down their Sermon Preaching books while having lunch at the institute, waiting in line for the water dispenser, or even taking a walk around the institute, and then demonstrated their ability to the full extent during the contest. Fourteen languages were examined at the contest including English, Spanish, Portuguese, French, Russian, Japanese, and Chinese. In particular, the participants for Myanmar language, Cambodian, and Thai increased greatly, compared with the previous contest. The whiteboards in front of the presenters were filled with drawings and notes in various kinds of languages. The participants show their foreign language ability to the full. “I’ve never been on an overseas mission trip yet, but I’ve constantly studied English at the thought that I would be able to preach the truth to many people later if I studied English, the most spoken language in the world. 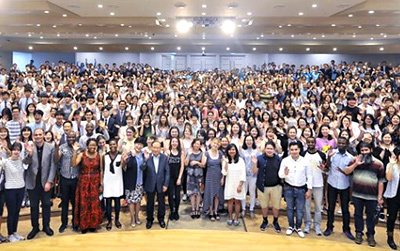 I’ve gained confidence that I can do it as long as I have passion and challenge it,” said Brother Hwang Ju-seon (Goyang, college student), who went on the stage as a representative of the awardees before the awards ceremony and preached in English. “I studied Hindi whenever I could find time because I have a vision for the overseas mission. I don’t want to just have conversations in Hindi, but want to even deliver my confidence in God’s love and truth,” said Brother Jahng Myeong-hun (Incheon, worker), who won an award for Hindi language. 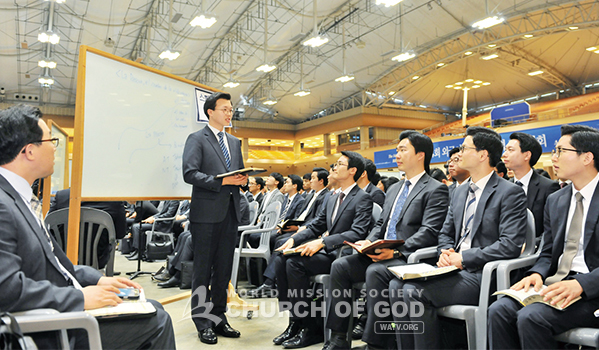 “There were some words and sentences that sounded a little unfamiliar and hard to understand in the Korean Bible, but I was able to understand them better by comparing them with the English Bible, and my faith also grew thanks to that,” said Sister Gu So-hyeong (Busan, college student) who won an award for English. “I will preach the gospel to exchange students at my college and to the foreigners I often come across, with faith and confidence,” she added her aspiration. 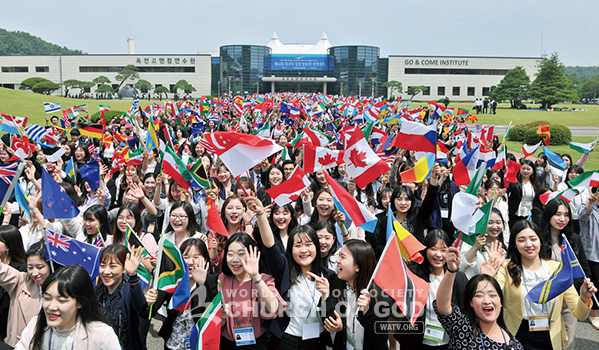 The participants who are determined to go for the overseas mission through the Foreign Language Bible Preaching Contest march at the institute, waving flags of all nations. This coming summer, the fervor for the overseas mission is expected to be even hotter by the members who have the ability to speak in foreign languages and passion for the gospel with the abundant Holy Spirit from Pentecost.